Today marks Veteran’s Day, a day Americans honor the men and women who’ve served. Marley Natural recently sat down with Sean J. Major, the first active duty Servicemember to receive a physician’s recommendation for cannabis and a current patient at our retail partner, Mankind Cooperative. Sean spoke about active duty, alternative medicine and his plans to help other Veterans heal after service. Marley Natural: Thank you for speaking with us Sean. Can you tell us when you joined the military, what branch and what your service entailed? Sean Major: I signed with the Marines in 2008 and went to boot camp January 5, 2009. Remember hearing about the pirates in the middle east and the Gulf of Aden in 2011 and 2012? That was us. We provided humanitarian support. After eight years of service, I left a Sergeant after finishing my second contract. When did you start to consider medical marijuana? Did something happen to make you look at alternatives to pharmaceuticals? I was in the Marine Corps and a patient at the Wounded Warrior Battalion. I'd sustained four traumatic brain injuries. I've had 30-something conditions and injuries that went up to the VA for retirement. I figured if the Marine Corps’ problem is they don't want you smoking because they don't want you getting high, how do I remove whatever is medicinal from cannabis and use just that? When I found this existed, I got excited. I dug deep into CBD and presented an idea. I asked my doctor if he endorsed the use of cannabidiol to treat symptoms associated with chronic traumatic encephalopathy, traumatic brain injury, post-traumatic stress, and other symptoms associated with military service. I had an opportunity to ask him on base, in front of a lot of people, and he gave a lengthy explanation why he does. It was an endorsement. That was a huge impact, not only for my leaders to witness, but it was also big for me. I felt like I was — I always felt I was on the right track, but that was definitely it for me. I've been advocating for the rights of those who want to medicate ever since. Yeah, what was it like to get a medical marijuana recommendation? Because you were on active duty when you received your recommendation, correct? Yes, correct. It was weird, because — it's almost like I've got to tell the whole story. After having so many brain injuries, I had a scan. They put me back on active duty after my second brain injury. Then I had two more within a month back-to-back. One was a mild and the other moderate. If I would've sustained those injuries by themselves, I don't think they would've been that big of a deal. But because I was recovering from a severe traumatic brain injury prior, those last two were just... It was bad. I had brain scans done and the Marine Corps said "it's not even a choice anymore, your time is up. Turn in your SAPI plates, turn in your gas mask, clean your rifle one last time and you're done." 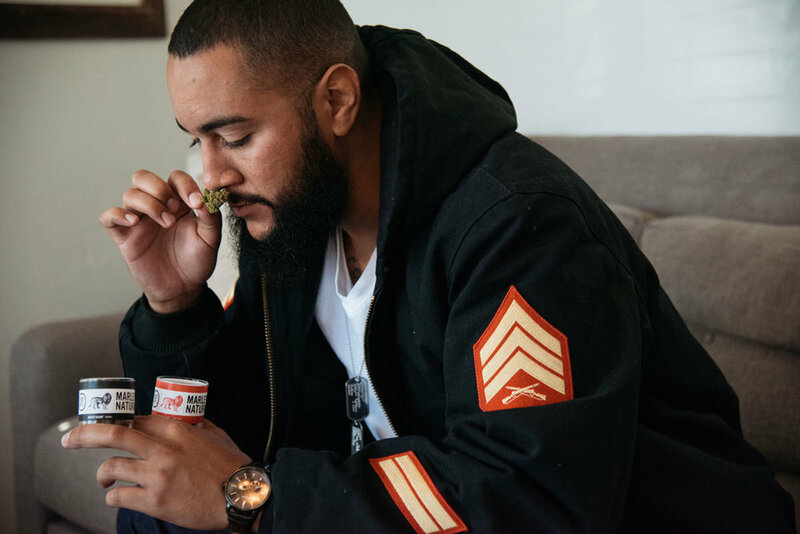 I was a patient at the Wounded Warrior Battalion and knew I wanted to get into cannabis when I got out of the military. My dad lived in Denver and I found out the only accredited education for cannabis at that time was online. I didn't have to wait until I got out. I became the only person in the Department of Defense with an accredited education in cannabis. Federal laws supersede State, I understood this, but the Marine Corps is a department of the Navy. The Navy supersedes the Marine Corps. Our Marine Corps medical is Navy med, so when I submitted a state's physician recommendation for the use of cannabis in AHLTA, which is the Navy's medical records, at that point I cut the legs off of the Marine Corps. While my recommendation was active they didn't test me for cannabis. It’s really important to clarify and identify how I did it, because the how is important. It exposed that loophole. It was good, because to be at the Wounded Warrior Battalion, you have to do stuff for your body, your mind, and your spirit, right? I was doing everything, but they weren't seeing anything for the mind, which is education and transition. But I was, I just didn’t tell them I was medicating with cannabis. When they checked me on it and said, “hey you’re not doing this” I replied, "actually I am." They took it to a board, sat down, did a character assessment, and really everybody had something to say. Medical staff, staff at the battalion and other various ranking people with different billets. They allowed me to work at Vet Meds, a delivery service. I remember the first time I saw all that stuff and I was like, "This is real. I won." Are other people on active duty able to get medical marijuana recommendations or is it still really difficult for them? It's still really difficult. I exposed the loopholes to avoid getting in trouble. I really didn't do anything illegal. By doing what I did, you want to talk about a gray area and pushing buttons, I really pushed some buttons. I'm sad to announce a Marine tried to follow after me. He did something very similar and they threw him in prison for it. That’s one of our next questions. Have any of your brothers or sisters in armed services used marijuana on active duty and if so, what happened? We’re at the point where you have Marines at the Wounded Warrior Battalion because they have debilitating injuries and symptoms associated with military service. If they don’t have access to pain medication that’s non-addictive, it's not their fault. We have guys missing limbs and with brain injuries. If he can’t use an alternative medication to keep him going through the day when the doctor can't see him for two weeks, that's a freaking problem. If he realizes, "Hey, (Sean) Major's alive. I know that the other guy died down the room from us. I know that was motivation for Major but guess what? He did it, he's alive. So, I'm going to try to do it too." Well, it didn't work out for him like that. They threw him in prison. They threw him in the brig. What was it like when people realized you had your medical recommendation on active duty? I was projected to retire in March or May. I didn’t get it. By August or September, it got to the point where my command asked if they were retiring me, at what percent and when am I getting out? It came to the knowledge of both myself and my immediate command they already made a decision two months prior and didn't inform anybody. By postponing the knowledge, it's a long story, but basically they didn't accept my retirement, they forced me. It's a forced out. I had to have submitted for retirement within the last 30 days I was in the military, which would've extended me another six to nine months. It was a forced out. Once you got out of service you said your recommendation was transferred to the VA. What were the steps required to go through that, was it difficult, easy? As far as transitioning records, I really didn't have to do much. I had to check in with people and check out. I had to go and see VA docs, but the transition part wasn't very difficult. What was cool about it is, I'm the first one to have it in my recommendation on the DOD side. When my record transferred over, that meant I'm the first one to have it transferred over to the VA.
Everybody's got a story dude, and it's funny because everybody has a cannabis story. Do you know, are there other men or women going to the VA that have medical marijuana recommendations after getting out of service? Oh, my geez, of course. I don't even know how to explain. The culture of disabled Veterans, and I say disabled Veteran to any percentage, we all look different and we all medicate in our own way. But to answer your question, it's a very simple yes, there's a lot of us. What are some things Veterans can do to get access they need to cannabis after service? Are there programs available? My advice to anybody, if you're moving to an area that is medicinal or recreational, still look to Veteran groups in that area. Even if they're not cannabis specific, I think that's a suicide prevention measure just to reach out to Veterans. Find what works for you. Find out who's running all-natural practices. If you're going to purchase or provide donations for your medicine, definitely get lab tested products. If you don't have any in your area, you've got to grow your own. Before our interview you said something powerful. You said more brothers and sisters in the armed services have died from pharmaceuticals and suicide than have passed away on active duty. Why do you think they're so apprehensive to let people get access to alternative medicine? I think for active duty specifically, it’s because it's not legal on a federal level. The younger you go in the ranks the more aware people are of what’s going on. It's just, it's politics. People say 22 Veteran deaths a day, but it's really 23 to 74, between Veteran suicides and pharmaceutical related deaths. Who’s the real enemy? We’ve got people back home seeing images of people who believe in different religions and we say that's the enemy. You know, I brought the enemy right here. The enemy is those pills. Thinking about just from pills to plants, how does cannabis help you and what are the differences you've noticed since switching from pharmaceuticals to medical marijuana? One of the biggest things is my overall level of cognitive ability. When you're on five, six, eight different pills but you're only treating three or four symptoms — everything else is to treat symptoms associated with the pills given to treat an injury. That’s the reality of where we're at. Other improvements? My speech has improved, my balance has improved, my walking is a lot better. One thing I lost with the brain damage was the ability to write. I used to write songs and I liked how I wrote, and when I couldn't do that anymore it hurt. Last month was the first time I was able to write something. It was by far one of the better things I've written, so that's an improvement. You said with your brain injury, you lost your sense of smell. But you mentioned certain terpenes help bring that back? Yes, I'm starting to. The first scent I picked up was Linalool. I was so happy because I'm from Spokane and that's lilac city, baby. I was so happy, thinking there's no way. I remember I couldn't stop. I couldn't get over sniffing this granddaddy, and I was just so happy. It was a blueberry granddaddy variant, and I was so, so happy. One of the last questions, why are you an advocate for the herb? Because I owe my life to it. When I was at the battalion and giving up, my last hurrah was "let's give this a try and see if I can do something with cannabis." I'm an advocate for the herb because I'll get a call one to three times a week from a Veteran who needs help growing or he needs help starting up. And about once every other week I have somebody come to me and straight up tell me, however they say it, but they let me know I made an impact on their choice not to take their life. Last but not least, are there any final thoughts or next steps for you? Yes, definitely. I've been trying to start my program 'Eden After Service.' It plays on the psyche. EAS is your End of Active Service, it's the day that you get out of the military. So you get out of the military, you immediately come to Eden. Expect a 20 to 40 acre property and tiny home community. We do adaptive sports like we would at the Wounded Warrior Battalion. No matter what's going on or what you’re going through, we can do something physically active together. We will also teach you how to grow your own cannabis. Veterans live at Eden and have on-the-job training for cannabis or cannabis cultivation while awaiting VA compensation, that on average takes nine months. What we're seeing is the 22 daily Veteran suicides, the majority of those happen within the first six months after service. So, I need help. I need people, a person, a group, that understand it really needs to be about the patient. Help me create a space where we can give people a place to live so they're not killing themselves. It's a preventative measure. Don't let Veterans go back to the bad scenario or the neighborhood that they tried to leave from. Don't send them back. I love my hometown of Spokane, but don’t send me back to Sprague on the east side after four brain injuries and PTSD. That's not going to go very well. I don't want to kill myself. I'm so blessed to have done something and stayed in San Diego, but that isn’t the story for a lot of people. I want people to be alive. To wrap it up, I need help providing people a place to stay. I want to teach them how to grow cannabis. Let me teach other men how to fish, don't give me the fish. Let me teach other men how to grow and I'll build you an army of the best growers you've ever had in your life, man.